…tells you the Earth is flat. One of the first things you learn is science is that common sense is one of the absolute worst ways to learn about the universe. 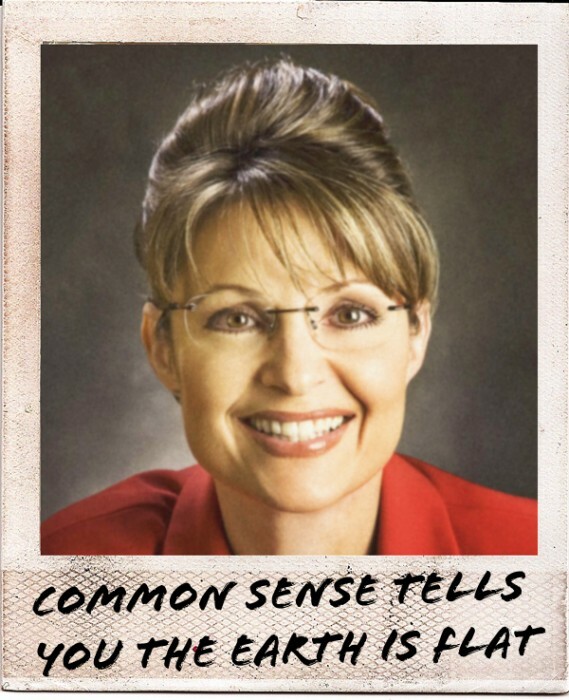 Common Sense is becoming so rare nowadays that there is no way in hell Palin has any. Common sense changes with advances science. 5,000 years ago, it was a given that the earth was flat. It just made sense. Now, we can physically see that the earth is a sphere, thus common sense dictates that the earth is round. People who think otherwise, or disagree with proven science in general have defects in the brain. The earth is actually an oblate spheroid. Sorry just a pet peeve, when people refer to science but don’t check their facts. Nit-picking here? Really? Did you know 2% milk isn’t *actually* two percent? I’m still fricken calling it two percent because it’s quicker and I don’t sound like a total know-it-all douche. Sure, but I didn’t need to go into specifics to get my point across did I? Common sense tells you that it is in fact flat, because it is. But since we are so small compared to it, it seems flat but is really round. True. When you plow the soil it’s good when Earth is locally flat, not round. Someone needs to make stuff up to mock Palin? Surely the intrepid googler can come up with something she actually said? And then maybe compare some of those examples if any, with any of obama’s numerous mis-speaks and then clarifying why it is okay for one and not the other.